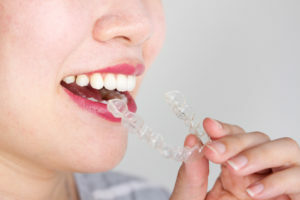 Invisalign aligners are customized trays that are made out of plastic, or something called “polyurethane resins.” To get really technical, these resins are actually a blend of methylene diphenyl diisocyanate and 1.6-hexanediol. They are also medical grade with a high molecular weight. This biocompatible material is strong enough to gradually shift the teeth through focused pressure, but also comfortable enough that you can wear them without any issue. Plus, because this material is clear, you can feel confident enough to speak and smile — even while you are straightening your teeth. To set you up with your treatment, your dentist will take X-rays and digital scans of your teeth to identify the proper treatment method for repositioning the teeth. This information is then sent to the Invisalign lab, where your aligners will be made according to the precise specifications of your treatment plan. Once the aligners have been created, they are shipped either directly to you or to your dentist’s office. You can begin the Invisalign treatment as soon as you receive your aligners. Because they match your dentition exactly at each stage of the process, Invisalign is comfortable — often more so than fixed metal brackets and wires. Many patients can benefit from Invisalign clear aligners. The only way to find out whether or not this is an option for you is to schedule an appointment with your dentist to discuss your orthodontic issues. Crowded teeth, gapped teeth, as well as overbite, underbite, and crossbite can all be treated with Invisalign. It’s never too late to benefit from straighter teeth and a more attractive smile. Don’t wait to find out whether or not you can undergo treatment with Invisalign clear aligners! If the answer is yes, you can usually get started right away. Dr. Rob Schumacher is a general dentist offering comprehensive services for the whole family — from general checkups and cleanings to Invisalign, dental implants, and more. If you are interested in straightening your teeth with clear aligners and would like to learn more about this treatment, do not hesitate to contact your cosmetic dentist in Wakefield at 781-334-3400.